The U.S.S. Enterprise pursues a Ferengi Marauder into an unexplored region of space after the mysterious Ferengi steal an energy converter from a Federation planet. In orbit above, Delphia Ardu IV, however, both the Enterprise and the Ferengi ship are immobilized in space by a force emanating from the planet. Lt. Commander Data (Brent Spiner) believes that some remnant of the Tkon Empire -- extinct now for 600,000 years -- may be responsible for the force draining power from the ship. 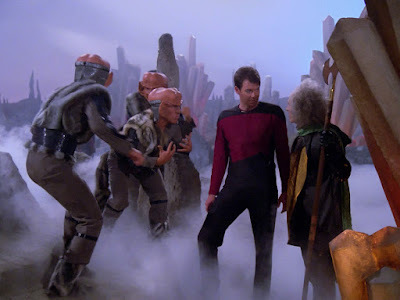 Hoping to learn more about the mysterious Ferengi and solve their mutual problem of power loss, Captain Picard (Patrick Stewart) suggests a joint away team to the planet surface, led by Commander Riker (Jonathan Frakes). 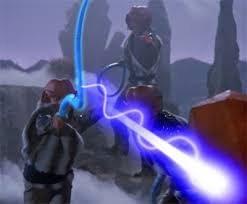 The Ferengi, led by Letek (Armin Shimerman), quickly prove untrustworthy, and the mission soon encounters a being called Portal (Darryl Henriques), a guardian of the Tkon Empire. Portal issues a challenge to the intruders in his Empire, and Riker answers it. 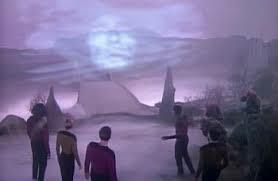 For some hopeful viewers watching this new Star Trek series in 1987, “The Last Outpost” might have actually been “the last straw,” another derivative, poorly-written episode of The Next Generation (1987-1994). In this case, the source material is clearly “Arena,” a beloved episode of Star Trek wherein two competing forces -- Starfleet and the Gorn -- are immobilized in space. Then, down on the surface of a planet, the two forces are confronted by a highly advanced alien with the power to destroy either competitor. Here the Tkon's sleeping guardian stands in for the Metrons, but in both cases, the advanced race is impressed by human values, and relents in its hostile pursuits. But significantly, “The Last Outpost” is like “Arena” in concept, not in execution. The episode is like “Arena,” only if all the excitement, thrills, and character growth of that story were removed from the equation. The great nemesis of "Arena," -- the Gorn -- has been replaced by the comedic Ferengi. And once more in The Next Generation, the Starfleet characters learn nothing from their adventure, but are all too happy to share their disdain for those less advanced than they are (in this case, the Ferengi). Once more, there is so much wrong in an episode of The Next Generation that it is difficult to know where to begin with an analysis. A fish rots from the head, so let’s begin with Captain Picard. This is the second time in four episodes that the writers have the character -- the captain of the Federation flagship -- surrender without conditions during a crisis. So, just think, if you were watching these shows sequentially in 1987, at this point Captain Picard had a fifty percent surrender rate when contending with danger. That's not good. Either in a desire to make him the “anti-Kirk,” or simply out of a lack of direction, the writers of The Next Generation were doing a great disservice to this new character, and the actor who plays him. 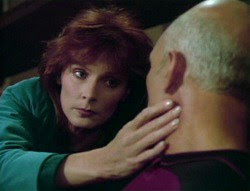 In “The Last Outpost” what exactly does Captain Picard do to help? He surrenders the Enterprise. He brags (on an open channel) about his bluffing: “at least we won’t start with weakness!” And then, as the temperature drops on the Enterprise, he falls unconscious. That's right: he goes to sleep. Can you imagine Captain Kirk, in the same situation, stopping the fight long enough to freeze to death in his chair? I can’t. He would have started a fire, using a phaser, to keep warm. He might have tried many things, but not taking a nap. Beyond the depiction of the Captain as weak and useless, “The Last Outpost” suffer from the same problem that “Code of Honor” did. In particular, there is no growth or leaning among the main characters. The stories don’t help them learn anything about themselves; they just confirm their apparent wonderful, evolved nature. Here, for instance, Portal reads Riker’s mind, sees the brilliance of Sun Tzu’s philosophy, and takes the side of the humans in the conflict with the Ferengi. Then, Portal and Riker talk together about how they shouldn’t kill the primitive Ferengi, and that some day the Ferengi might grow up, or mature out of their foolishness. The problem, as I wrote in my last review, is that this smugness is pervasive in these early episodes of The Next Generation. The human are always right and evolved, so much so that they feel the need to lecture others about how right and mature they are. I submit it is a better paradigm to feature flawed characters, and show them grow through their adventures. It isn’t very exciting, or even entertaining, to see smug characters rewarded for their smugness. Now, let's move to the Ferengi. Some fans may disagree with me on this point, but I believe the idea of the Ferengi is brilliant: Yankee Traders. The Ferengi are crony capitalists; capitalists run amok. They live by the motto "caveat emptor." If the original Star Trek functioned as a Cold War allegory with Starfleet representing the United States and Klingons representing the U.S.S.R., then the Ferengi represent a daring risk for the 1980's. They represent America in the age of “greed is good” Gordon Gekko. I think that in concept and execution they are ambitious, even genius. They are a mirror to who we were, as a nation, in the Age of Trickle Down Economics. However, in terms of physical dimension, there can be no disagreement: the Ferengi are not threatening. And in terms of demeanor, they are not malevolent, but deeply funny, and satirical. In other words, I believe the Ferengi are a perfect mirror by which to comment on American society of the 1980’s, but not at all suitable as the main villains of a Star Trek series. They just aren't threatening, scary, or menacing in the slightest. The flaw here was not in the nature (physical or ideological) of the Ferengi, but in the role they were designed to play on the series. The Ferengi are silly and energetic, yet but not at all a counter-balance to the Federation's might. One thing I love about Star Trek: The Next Generation is that it did not abandon the Ferengi because of a weak episode or two. After another episode in which they were supposed to be the “big bad” (“The Battle”) someone in power realized that the Ferengi should instead be a kind of cosmic irritant and comic-relief for the series. That transition was brilliant, and gave us characters such as Quark (Armin Shimerman) on Deep Space Nine. Star Trek redeemed the Ferengi in later seasons, and later series, and with outstanding characters such as Rom and Nog. 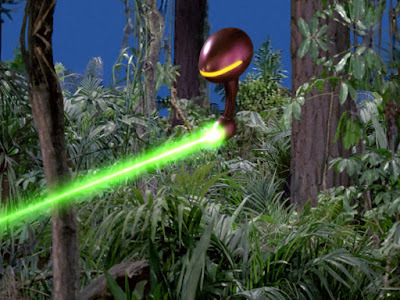 The writers could have looked at “The Last Outpost,” deemed it a failure, and never featured the aliens again. 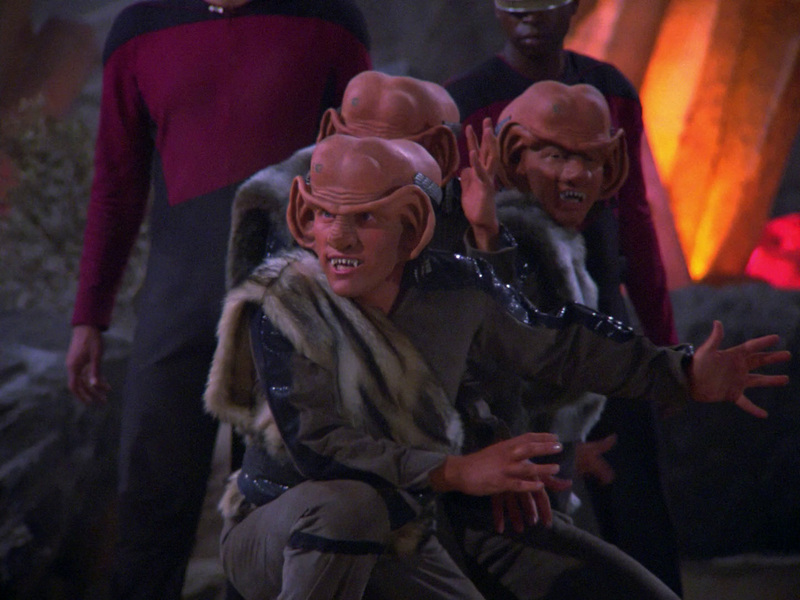 Instead, the Ferengi remain, today, one of the most fascinating and well-developed races in Star Trek lore. Again, this seems a matter of Star Trek: The Next Generation getting its space legs. The writers knew that the Ferengi were clever conceptually. But they couldn’t figure out, initially, how to use them in a compelling story, at least as an antagonist. Part of the problem might not be the episode’s fault, either. I remember the preview for this episode airing on WPIX Channel 11, out of New York. The narrator breathlessly spoke of the Enterprise crew fighting alien “predators,” and that description set up the belief for many viewers that the Ferengi were going to be a terrifying alien race and a real threat to Starfleet. And of course, none of that materialized. The extremely negative response to the Ferengi n “The Last Outpost” could be, simply, a matter of high expectations quashed. Once you know the Ferengi for what they are, in other words, the episode is not so bad. Visually, “The Last Outpost” is actually top-notch. The episode features a terrific miniature to depict the Ferengi Marauder (one reportedly designed to look like a horseshoe crab), and some of the action on the misty surface of the Tkon planet is quite stunning. The moment wherein Portal’s face appears out of the swirling winds is highly cinematic, and impactful, for instance. Also, the hologram read-outs in the Enterprise briefing room look terrific, and I wish they had been used throughout the series. The first season really had some bad episodes. Like the first four you've reviewed. It's still Star Trek so the whole season 1 is watchable with the right mood. There are zero episodes in season 1 to get to my top list, though. The viewscreen activates, and we get our first look at the formidable aliens. My friend, with whom I watched the episode, burst out laughing. How should we take this...thing...seriously? 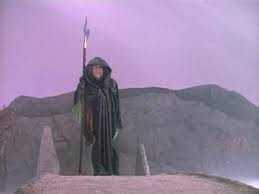 I later heard the Ferengi referred to in fan circles as the "Jerry Lewises of outer space." The criticism has some validity. 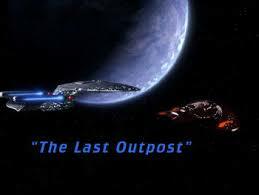 I enjoyed many of the aspects of "The Last Outpost," but it, like the previous three episodes, does not hold up under scrutiny at all. Portal seems to come around without any kind of conflict or struggle. One minute he's threatening to kill everyone, and the next, he's ready to have a beer with Riker. It just seemed too silly. It still does. As you say, this was the seed for greater things in the seasons ahead, and we wouldn't have had those moments were it not for this initial meet-up with the Ferengi. Can't make an omelette without breaking a few eggs, I guess. "[The stories] just confirm [the Enterprise crew's] apparent wonderful, evolved nature." This reminds me of a comment Harlan Ellison made in response to Roddenberry's belief in the potential of the human race to be perfected: "But those third-world aliens, they can be dirty rotten...talk about your White Man's Burden!" It also reminds me of your comments about the Jedi in Episode I. Would you say that the Federation's complacency in the first season made them vulnerable to the Borg, the way the Republic's flaws weakened them to the Sith/Empire?